Tired of boring plain cushions? 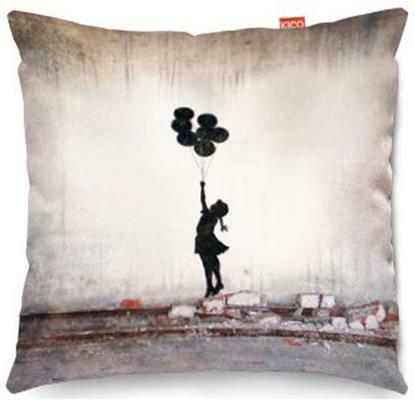 The Banksy Balloons Sofa Cushion is the next best thing to have. Crafted from high quality fine faux suede, this one is handcrafted in the UK. The cushion features the graffiti artwork of one of the most famous artists in the world, Banksy. It showcases a silhouette of a little girl in pigtails as she holds on to a set of balloons, clinging despite the fact that it's lifting her off the ground and taking her away. It's a wonderful sentiment and open to personal interpretation. Use this cushions for accessorizing a couch, an office chair or even a bed. The design is simple but it's definitely striking, something that's difficult to achieve.